In the first episode we heard of Leefe Robinson’s early life in India and his school days. From joining the Royal Worcester Regiment in 1914, he applied for the Royal Flying Corp and started his early war, delivering planes. By Christmas 1915, Robinson had all the qualification necessary and was loaned to No 10 Reserve Squadron, part of the increasing London defence squadrons flying from Suttons Farm field in Hornchurch and created specifically for ‘Strafing Zepps’. ‘On January 31, 1916 while Robinson was delivering another aircraft, the Germans launched one of the largest raids with nine airships. 20 Home Defence aircraft went up to meet them. The damage caused by the Germans was considerable and not one of the home aircraft managed to make contact with an airship. Eight aircraft crashed and two pilots were killed. The next day Billy the Birdman was posted to Hornchurch. He joined part of the 19th Reserve Squadron at Suttons Farm. 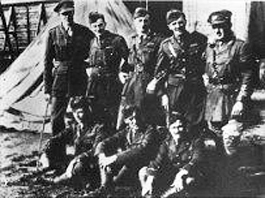 (pictured right) From two machines kept in tents, the squadron became 39 squadron and boasted 18 aircraft. There was however, a lack of night flying pilots, Robinson making the grand total of two. He was given command of ‘B’ flight along with wooden hangers for the BE2c’s, and further improvements were made, particularly for night flights and landing aids. Also experiments with ordnance took on a new meaning with apparently some instant failures dreamed up by armchair boffins who never got more than a few feet off the ground. Robinson’s flight became a closely knit group of friends, Lieutenants Brock, Durston, Mallinson, Sowrey and Tempest, but each faced the same problems of engaging the airships and landing at night returning with a full load of bombs if no contact had been made with the airships. It was something apparently that caused a large number of deaths of inexperienced pilots not used to flying at night. Leefe Robinson saw his first action on April 25 when his squadron was patrolling the City. He spotted the airship piloted by Hauptmann Erich Linnarz ( pictured left) when it was lit up by the defence searchlights. Patrolling at 7,000 feet he noticed the searchlights pointing north and spotted the airship. Of the eight pilots only Billy the Birdman got close. According to his flight report, he was already on patrol : ‘I turned and climbed to 8,000 feet and was in a good position to use my machine gun firing under the ship,’ he wrote. He fired three times but the gun jammed five times and he only got off about 20 rounds. Minutes later he lost sight of the ship. In the same month he heard of his brother, Harold’s death. Fighting with the Grenadiers of the Indian Army, he was killed in the attempted relief of Kut-el-Amara. The turning point in the battle against the airships came in the summer of 1916 with the creation of an exploding bullet. It was invented by an Australian engineer John Pommeroy, who notified the War Office of his discovery in 1914. They turned him down, but he reminded them again in 1915, and it was ignored again. Fortunately he was not one to be put off and in early 1916, the War Office took another look and in trials, discovered that when used in combination with another exploding bullet invented by Commander Frederick Brock, they both proved to be what was needed and put in a massive order. War production jumped into gear so that stocks arrived in the Home Defence units by September 1916. It was just in time as September 2 saw the largest raid of the war by 16 airships, from the Naval and Army divisions. Carrying a payload of 32 tonnes of bombs it was a determined effort to bring England to her knees. 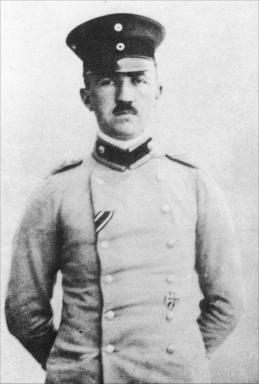 One of the number and an airship destined to immortality, was SL11 commanded by Hauptman Wilhelm Schramm who had been born in Old Charlton Kent, and lived in England until he was 15 years old. He was one of the more experienced captains and his crew had already served with him on several raids in another airship. SL11 was commissioned in August 1916 so a new addition to the German fleet. Leefe Robinson and his squadron had been put on alert at 23.00 hours after radio messages from the airships had been intercepted. Robinson was first away in his BE2c ( below) and flew into thick fog and had to increase height to get above it. He had three drums of Brock and Pommeroy ammunition and just enough fuel to keep flying for three and a half hours. Flying from the north of London, Schramm passed over Royston and Hitchin, following another airship that heavily bombed over Dartford and Tilbury Docks. Thinking he was over London Docks the captain took his airship to 13,000 feet. It was at the ceiling of the British fighters, but Leefe Robinson spotted the airship in the searchlights and went to attack it. The Captain, now with a much lighter airship having released his bombs, made for clouds and dropped height for added speed running ahead of Robinson and disappeared. Leefe Robinson had been in air for two hours and only had enough fuel left for a further hour and a half. Still over north London, SL11 was caught in searchlights from Finsbury and Victoria Parks and over Alexandra Palace, the Finsbury gunners threw up everything they had at the airship. Schramm turned his ship and headed for Walthamstow trying to dodge the searchlights. The commotion had attracted thousands of Londoners who watched the aerial ballet and must have groaned as the gunfire seemed to have no effect on the enemy. But then the mood changed as someone spotted a single aircraft flying through the shell fire approaching the airship head on. It was Billy the Birdman, who was still searching for his lost airship, and noticing the commotion over Ponder’s End flew on to meet his new target. With what was described as intense shellfire, he ploughed on, and remembering how the first airship had escaped him, he plumbed for height and by this time he was heading straight for the airship. The reports of that moment were of thousands of Londoners craning their necks and watching this uneven gladiatorial display between the tiny aeroplane and the massive bulbous cigar shaped killer airship that seemed to be totally invincible in the cacophony of exploding gunfire. The scene was apparently one that could not be imagined as the excitement of impending contest with the leviathan was greeted with a massive and audible groan as Hauptmann Schramm took SL11 into cloud and disappeared from sight. next week Billy the Birdman sets the sky ablaze. Paper Planes will run at The Queen’s Theatre from Wednesday July 30 for five performances and finishes on Saturday August 2 with a matinee and evening performance. Tickets are £10 to £15 with concessions and available from box office on 01708 443333, or online at queens-theate.co.uk. Barry Kirk is a Photo-journalist of 40 years’ experience in news media, Deputy Editor of Romford Recorder and promoted to Editor of sister paper Barking and Dagenham Post. Now freelance with small publishing and photographic services company. He had a just started an Arts Blog for Havering and surrounding areas. Reference: Royal Worcester Regiment Archive.